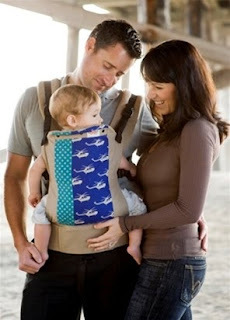 Beco Baby -known for their gorgeous baby carriers - has come out with some new prints. They have brought in a new spring print called Ginger which will be available on both the Butterfly II and Gemini and some limited edition specialty prints available in a limited quantity only on the Butterfly II. The specialty print for February is Duke which sports a super cute set of pattern and is especially great for those looking for a boyish print. It has turquoise dots and cream helicopters against a bright blue background! The body and straps of this carrier are sand colored brushed canvas which is super soft!! The ginger print is a cheerful, year round floral on chocolate background and is combined with Espresso brushed canvas straps. Stay tuned for more special prints to come!! All these products are now available from DaintyBaby.com.